The Skid trail is located in the Grand Mesa National Forest near Grand Junction, Colorado. 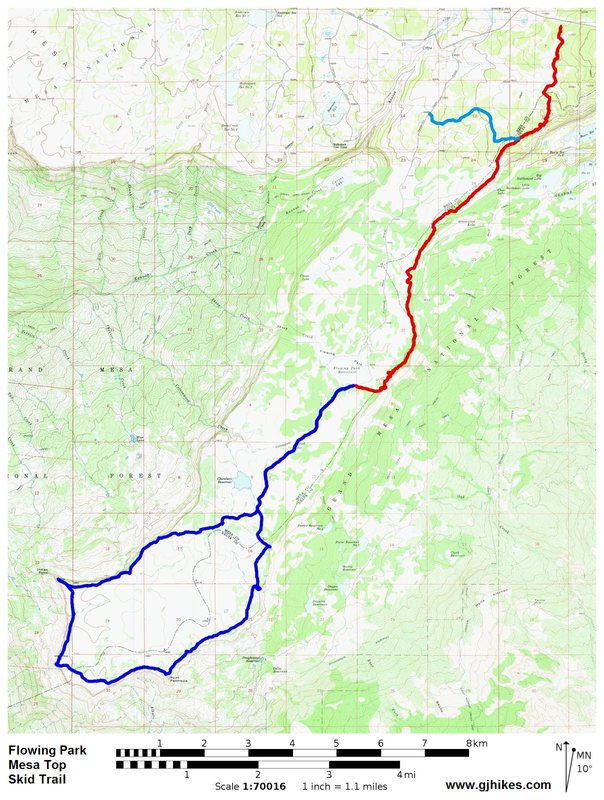 The 1.8 mile trail connects Forest Road 109 to the Mesa Top trail. For its first 4 tenths of a mile the trail follows a gravel road that is open to vehicles and OHVs. 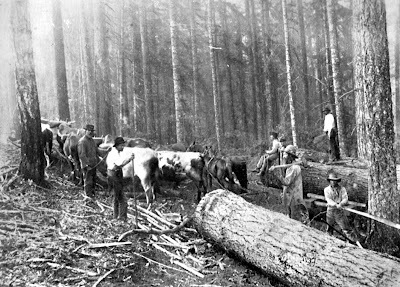 The next 1.3 miles of the trail makes use of an old skid road that was leftover from an earlier logging operation. 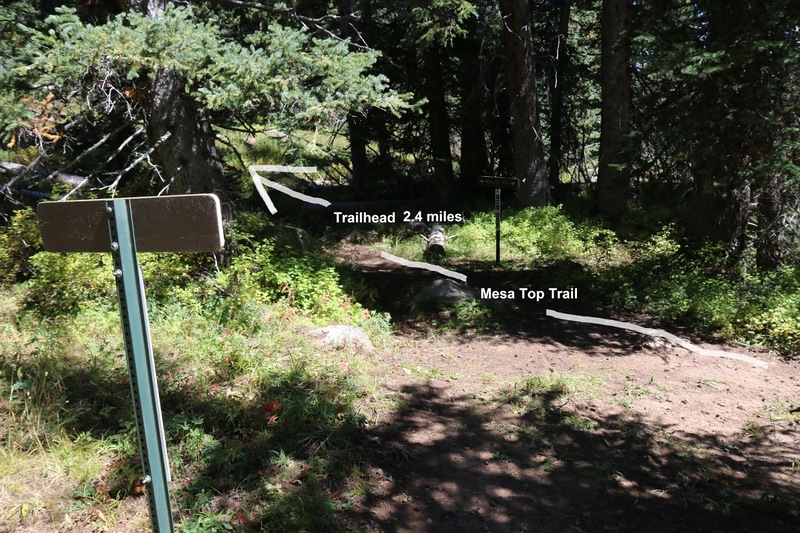 From the 1.7 mile point the Skid trail follows a newly constructed singletrack trail that connects it to the Mesa Top trail at a point that is about 2.4 miles from the Mesa Top trailhead. This post follows the Skid trail from where it departs off of FR 109 to where it connects to the Mesa Top trail. The trail sign in this photo is about 1.1 miles from the Lands End Road and 4.4 miles from Flowing Park Reservoir. The first section of the trail follows a graveled road. There are several primitive campsites along the road with a few being large enough for a good sized camping trailer. Vehicle traffic ends at the 0.41 mile point. From here on travel is restricted to hiking, mountain biking and horseback riding. As the trail leaves the gravel road it looks at first like a singletrack but that is due to the rocks that were put in place to discourage ATV's. As the trail progresses it begins looking like a road again. 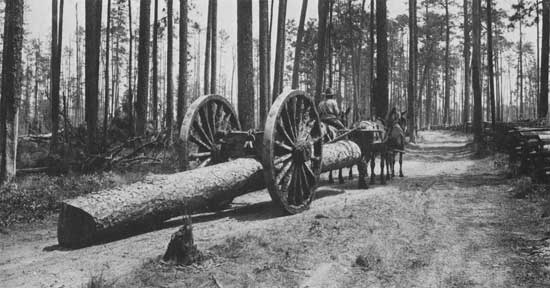 In days gone by logs were moved over skid trails by teams of oxen that were driven on by what were called 'misery whips'. Mules with a contraption similar to the one in the above photo could be used where the terrain permitted. Parts of the Skid trail do travel out in the open where there is more exposure to wind and lightning. Not a problem on a day like this one though. At the 1.73 mile point the trail leaves the old skid road. The singletrack portion of the trail is less than a quarter mile in length. It is a short section that for some reason or another we tagged it for a moderate MTB skill level with everything leading up to here being easy. The trail comes to an end at the Mesa Top trail where you can go to the left and arrive at the Mesa Top trailhead after about 2.4 miles. If you opt to take the trail to the right and loop back to the start of the Skid trail the total distance will be about 9.7 miles on top of what you have already completed. If you were just out for an easy hike or ride then the simplest thing is to turn around and return the way you came. The Skid trail adds one more option to the many that were already available on this part of the Grand Mesa. 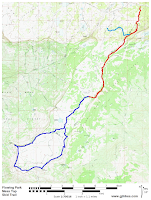 It is possible to connect over 100 miles of trails to come up with routes where you never cover any section of trail twice. That actually happens every year when they run the Grand Mesa 100 race. As far as the Skid trail goes it is nice to see an old logging road that has been reclaimed for recreational purposes. If you would like to see it for yourself then all you have to do is grab your bike or 'Take a hike'.